Latest Bank Vacancy notification is out today on 20th June 2018 to recruit Officers in various branches. South Indian Bank is looking to heir fresher Indian Graduates for Officer posts only. We are sharing this information after reading the official PDF file issued by South Indian Bank. So we personally advise you all to must check the official PDF file also before applying this Bank Vacancy. 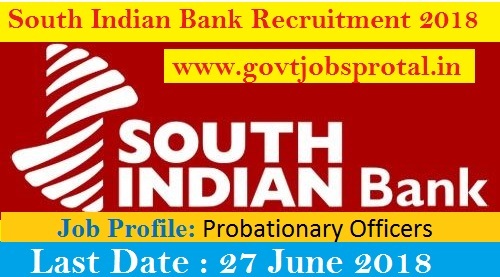 South Indian Bank is looking to filling up 100 vacant positions of Probationary Officers in India on regular basis. This South Indian bank careers making opportunity is open for all Indian citizen that means any candidates belonging to Indian can apply for this Bank Vacancy 2018. Those who are interested to make a Banking career with one of India’s premier commercial Banks can apply ONLINE for this South Indian Bank recruitment 2018. More information related to this Bank Vacancy is given below in this article. Read the whole article carefully before applying these Bank jobs in India. What Eligibility Criteria is required for applying this South Indian Bank Recruitment? Indian Graduates with minimum 60 % marks in any stream can apply for this South Indian Bank recruitment 2018. Those who are wishing to apply this Bank vacancy must have age less than 25 years. What is Application Fee for applying this Bank Vacancy? You can use the following way for paying application fee: “Debit Cards, Credit Cards, Internet Banking, IMPS, Cash Cards/ Mobile Wallets”. How we can apply for this South Indian Bank Recruitment? Those who full fill all the criteria and other condition can apply for this Bank vacancy through the ONLINE process only. There is no other process for applying. The process for applying online will end on 27th June 2018. So candidates have to apply online before this date. Visit to the official website for applying online. We share the reference link below related to this Bank recruitment process. Check IMPORTANT LINK section for more detail. First Round will be the Online Written Examination. The Third and Last round will be the Personal Interview. Those who cleared all these round of selection will be appointed as Probationary Officers in the various branches of Banks. 27 June 2018 Last Date for apply online.